Hi my dear followers, after a few days off it's back to the routine but this time with energy. Today I bring you two looks in one, the same look with different styles, how? 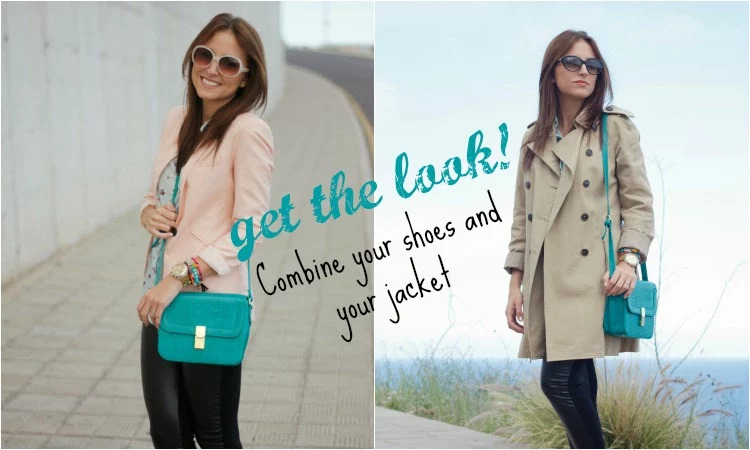 changing the jacket, sunglasses and shoes. En este primer look la finalidad es conseguir un estilo chic con la tendencia del verano, los colores pastel. Salvo los leggings de cuero, todo el look está construido en tonalidades turquesas y salmón. La blusa la compré en Stradivarius y lo que más me gustó fue su tejido ligero y la combinación de colores tan bonita, podéis conseguirla haciendo click aquí. Si os fijáis bien, he doblado los leggings para hacerlos más cortos y que quedaran encima del tobillo, es otra forma de llevarlos, ¿os gusta el resultado?, ¿qué opinas de este primer look? In this first look the purpose is to get a chic style with summer trend: pastel colors. I bought the blouse in Stradivarius and what I liked the most was its lightweight fabric and the combination of colors so beautiful, you can get it by clicking here. In Addition, I folded the leggings to make them shorter and remain above the ankle, is another way to wear it. What do you think of this first look? En este segundo look he buscado ante todo la comodidad sin perder el toque chic que puede darte una prenda tan clásica como un trench. El tono camel combina con cualquier color y armoniza el outfit, ya que he añadido otro estampado que es el de leopardo en los zapatos. Me gusta mezclar diferentes prints y ver los resultados y si no estoy segura, opto siempre por los complementos. Un look perfecto y cómodo para trabajar, ¿qué te parece esta segunda combinación? Muchas gracias por vuestros comentarios y visitas. In this second look I get comfort and elegance with classic garments such as a trench. The camel tone combined with any color and harmonizes the outfit, and I've added another pattern that is the leopard flat shoes. I like to mix different prints and see the results and if I'm not sure, always opt for accessories. What do you think this second combination? Thank you very much for your comments and visits.